Author Cynthia ChristianPosted on September 30, 2009 Categories UncategorizedLeave a comment on Does Jack know this? What If the Principal and You Don’t Agree? Last year, I had a student in my third grade class who was not meeting any grade level standards. His parents spoke Spanish, but since he moved here at 4 years old and had been to three different schools, he didn’t really speak English or Spanish. During his SST meeting, the principal decided he was a candidate for Special Day class. I argued with her that it was because he had never been taught consistently, he had switched schools so often that he had gone from English immersion to Spanish instruction to ESL/mainstream class. His language issue was preventing him from achieving grade level standards, not because he needed to go to Special Day. The principal looked at me while I was explaining this and with her look she let me know that she wanted this student out of the school because he was a drain on our resources and he was bringing the test scores down and that I shouldn’t mess up her plan. I thought about the right thing to do. I knew she’d make my year more difficult. This would affect all my other students. But letting this child go to Special Day when he needed other resources was wrong. It doomed the child. I looked at the parents who knew nothing of what was transpiring at the table. Their child’s future was in my hands. I told the parents that their son was not a candidate for Special Day, that he needed other help that was available at our school. The parents were ultimately convinced by the principal (at a separate meeting where I was not invited) to send their child to Special Day. For the rest of the year, my class was discriminated against. My class never got the new math workbooks. “There wasn’t enough for each class.” I was told. We never won any awards, never were included in special programs – all things that hurt the rest of my students. I care about ALL my students. What do I do next time? Do what I know is the right thing in my professional opinion or make my life easier and better for my class by going along with the principal? Author Cynthia ChristianPosted on September 23, 2009 Categories UncategorizedLeave a comment on What If the Principal and You Don’t Agree? 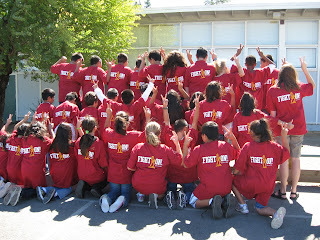 Laurel Golden’s 4th/5th grade class chose the University of Southern California. As a member of the USC Alumni Club of the North Bay, I walked into her class yesterday with a box of USC t-shirts (donated by the USC Alumni Assoc.) for her students. They jumped up, put the t-shirts on over their clothes and entertained us with a So-Cal Spellout and fingers in the air and chants of “Fight On”. They are wearing their shirts at the all-school assembly today. Teaching, USC and getting to write about it – my three passions come together! Author Cynthia ChristianPosted on September 17, 2009 Categories Uncategorized2 Comments on Free T-shirts! Where were you before you came to my classroom? A few years ago I had a new student who was put into my second grade classroom because of his age. He had never been to school before. He would crawl under his desk and bark like a dog. Author Cynthia ChristianPosted on September 3, 2009 Categories UncategorizedLeave a comment on Where were you before you came to my classroom? Author Cynthia ChristianPosted on September 3, 2009 Categories UncategorizedLeave a comment on What’s My Name?